Avocado trees are thick evergreens that produce a delicious and nutritious fruit. According to VegetableGardener.com, avocados are good for the heart and eyes, offering 20 vitamins and minerals. In Spanish-speaking countries, avocados are known as “alligator pears” because of their pear shape and bumpy skin. They’ve been linked to large prehistoric animals such as dinosaurs, as no modern animal is able to eat a fruit that’s as enormous as an avocado. After eating an avocado some people enjoy starting a new tree by planting its large seed. Avocados grow in warm tropical and humid areas such as Mexico and Central and South America. In the United States they grow in Hawaii, the South and Southwest. While Mexico is the top producer of avocados worldwide, about 90 percent of all avocados grown in America come from California, according to VegetableGardener.com. An average avocado tree grows to about 30 feet tall, according to the Purdue University Department of Horticulture and Landscape Architecture website. Because they grow as wide as they are tall, adequate spacing is needed between trees. There are cultivators that are columnar-shaped, but others have almost a prostrate form. Avocado trees have glossy, dark-green leaves that are sharply pointed. Unlike most trees, their flowers typically appear in winter from January through March. Flowers appear in panicles (branched clusters of flowers) containing up to hundreds of flowers. A mature tree is able to produce more than a million flowers during a single flowering period. The flesh of their fruit is deep green near the skin, but turns yellowish nearer the inedible seed. Avocados must reach full maturity before they’re harvested. Fruit can remain on trees for several months after avocados have matured. 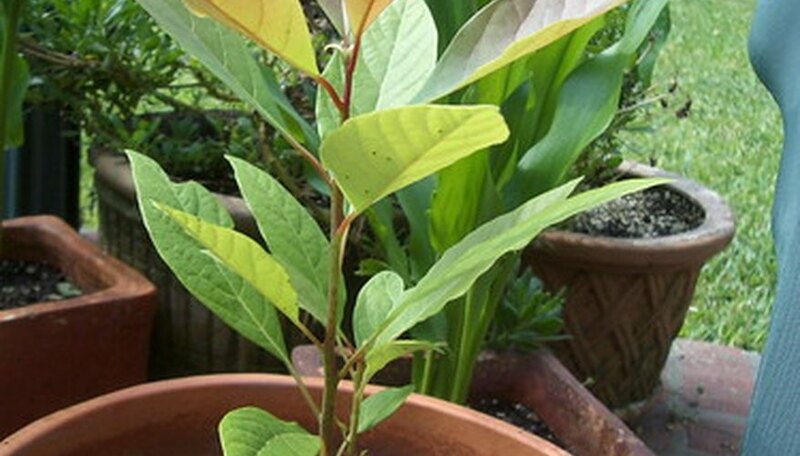 There are three different races of avocado trees: West Indian, Mexican and Guatemalan. The least cold-resistant are the West Indian types, although they’re the hardiest regarding some diseases. Mexican avocado trees can take cold temperatures more than other varieties. This type of avocado tree has extremely thin skin and fruit ranging in color from green to purple or black. Some Mexican varieties are Bacon, Fuerte and Zutano avocados. Guatemalan avocado trees, which produce fruit with thick, bumpy, blackish green rinds, need to grow in frost-free climates. Some of the popular Guatemalan varieties include Hass, Reed, Gwen and Pinkerton. One of the most critical considerations in growing avocado trees is location. Because these trees don’t have bark for protection from intense sun, they have to be planted under shade. Drainage is another basic consideration as avocado trees won’t grow well in poorly drained soil as this can cause root rot, which is the main problem in growing avocados. Although it’s normal for fruits and flowers to drop, too much shedding is unusual. It’s often changing or cold temperatures, drying winds and insufficient soil moisture that can cause excessive shedding. An avocado tree that blooms with little or no fruit is probably due to inadequate pollination. Rats, squirrels and rabbits can strip an avocado tree, but trees can be protected by tin truck wraps.